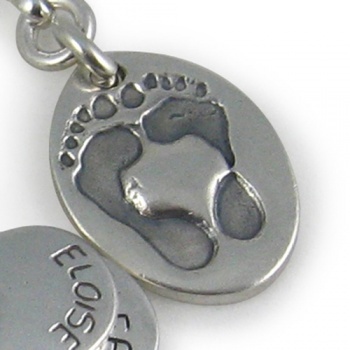 Our Chunky charm footprint necklace can have 1 or 2 hand or footprints and a name. Choose from 6 pendant charm shapes, 4 chain styles and several different lengths. Our Chunky charm footprint necklace can have 1 or 2 hand or footprints and a name. 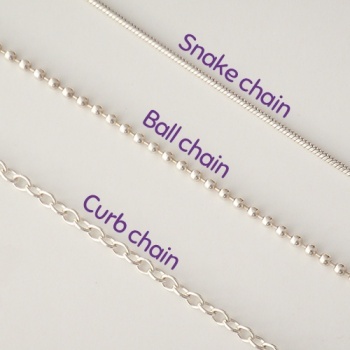 Choose from six pendant charm shapes, four chain styles (snake, curb or ball) and several different lengths (16"-24"). The Chunky footprint necklace charm is twice the weight and thickness of a Classic charm. 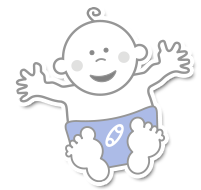 Choose between lowercase handwriting, uppercase handwriting or hand stamped lettering styles for the engraving. The inkless print kit needed to take your prints is included in the price. You take your prints and complete the order form so we know what name and lettering style that you want. Then simply return it all in the reply paid envelope or scan and email the prints to us.